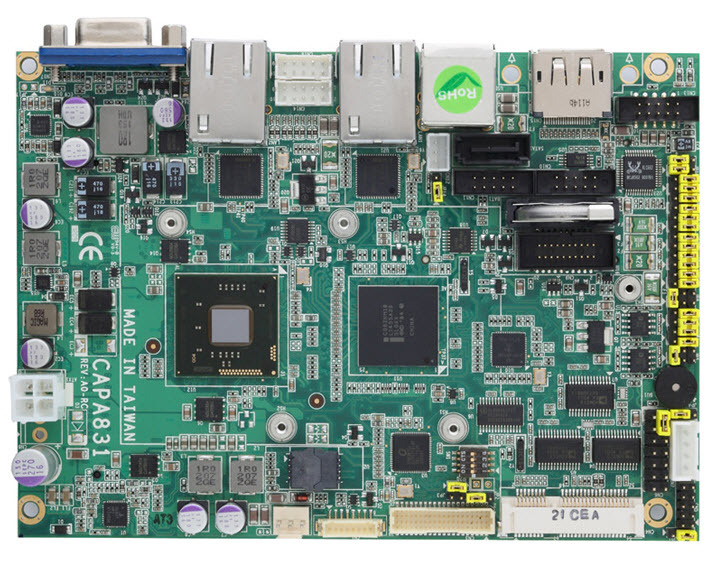 The CAPA831 3.5-inch embedded board is designed to support the newest ultra low power Intel Atom dual core processor D2550 1.86 GHz, N2800 1.86 GHz and N2600 1.6 GHz with the Intel NM10 Express chipset. The small form factor CAPA831 with lower power feature enables fanless designs and smaller footprint system design, and provides customers with a better choice for higher level graphics and system performance. This 3.5" embedded board supports system memory up to either 2 GB or 4 GB of DDR3, depending on the processors. The maximum memory for Intel Atom processor N2600 is suggested to be 2 GB. It also comes with multiple display outputs: DisplayPort, LVDS, and VGA with dual view supported and has a wide range for storage, I/O and expansion connectivity. This low-power platform is made for in-vehicle infotainment, industrial control, automation, gaming, medical devices, self-serve terminal, digital signage, fanless devices and much more.